Happy Fall! Print the pages in the file, cut, laminate, and glue to a ribbon to create this banner to enhance your fall decor at home or your classroom decor! The background is a textured black digital page with orange boarder. The font 'looks so scary' . This banner is great for parties, bulletin boards, or even to hang at home. 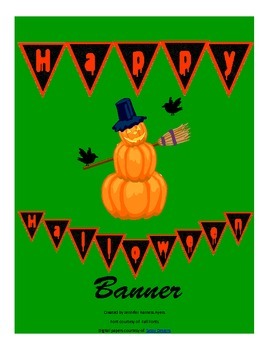 Along with a "Happy Halloween" message, you can also create a "Happy Fall" message. The look of the pennants are shown on the cover of the product!